When he thought we weren’t looking, THE BIG CLUNKING FIST dropped the mother of all clangers yesterday when he demanded the scrapping of Scotland’s separate education system and for education in Scotland to be integrated into the English education system, controlled by the (English) Education Secretary, Michael Gove. 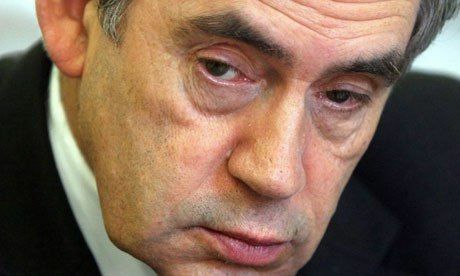 Former Prime Minister, Gordon Brown, a lauded “heavy hitter” of the anti-independence establishment and self-proclaimed North Briton, is seen by many as a maverick, saying what others in Westminster are privately thinking. During a speech to 1,500 people at Edinburgh University, Mr Brown said: “Around half of Scottish 14 to 17-year-olds do not want to be part of an exclusively Scottish education system but want a UK system where ‘the curriculum and exams are the same for everyone in the UK’. SNP MSP Kenneth Gibson said Mr Brown’s “bizarre” speech “makes the Yes case for us” because it would mean controversial UK Education Secretary Michael Gove would be in charge of Scottish policy and tuition fees for students. We ourselves see the dismantling of Scotland’s trappings of statehood as an inevitable consequence of a rejection of independence. 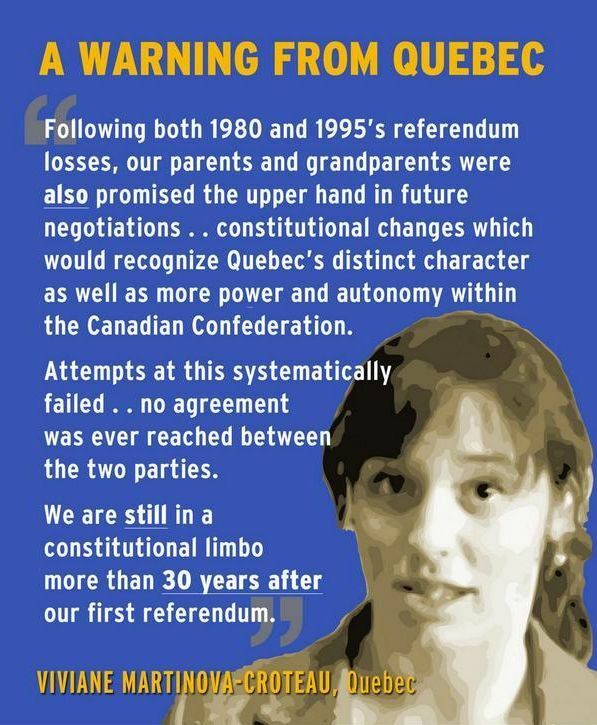 The example of Quebec has shown that there is a real risk of reprisals after a NO vote, even if that vote is tight. Alain Gagnon, of the University of Quebec in Montreal, has stated: “People need to be aware, if you go for a referendum, if you lose it you will have to pay a price. You can’t lose the referendum and not lose something else”. The Sunday Herald reports Bernard Drainville of Parti Quebecois as saying: ” … I am convinced that the strength of the Scottish indy movement is the key determinant of Scotland’s bargaining power with London. The fact that there is a strong indy movement gives you the strength to protect your interests, to get the better deal from London … So my advice to Scots would be: don’t miss your chance. Per the London Government’s published legal opinion that Scotland was extinguished in 1707 when it was absorbed by England, and the scotching of the theory of “states within a state”, there will be concerted and coordinated efforts to dissolve the instruments and protocols of Scotland’s status as a country within the UK (AKA England), and to recast it in the public’s mind as just other northern region of Britain. That outcome follows necessarily since our English Government has given this learned opinion the imprimatur of THE official reference to be consulted when dealing with matters constitutional and Scottish. Precedent gives cause for concern that if we remain part of England, and ever again become uppity, Westminster may retaliate with a policy of managed decline of this northern region’s economy a la Geoffrey Howe et Liverpool during the Thatcher regime (the 30-year rule, forced the publication of the minutes of cabinet meetings exposing these troubling narratives) . A NO vote risks an inevitable and inexorable descent of our culture into obscurity and obsolescence. Our legal system, unique education system, and our NHS, of necessity dismissed and rejected by the statists as incongruous anachronisms, predicated on the once-held delusion of our uniqueness as a people and a country. The unacceptable risk is that the country we love will be permanently subsumed as a neglected and reviled low-opportunity Celtic backwater of a Greater England. Gordon Brown who benefited from Free Higher Education in Scotland has the audacity to ask us to vote no in the full knowledge we will have no chance of saving the NHS if we do. All in the hope that UK votes in a Labour government in 2015. He has now waded in with this! How on earth I ever admired this man is beyond me! He’ll no be getting my vote that’s for sure. Though could I be reading this article wrong, could it be that young people want the same education system in the UK however based on the Scottish model!? if so sounds good, though the what about the Irish and Welsh education systems? There are good and bad in all education systems though I for one would hate to see the Curriculum for Excellence disappear. Labour and its counterparts are threatening to remove devolved education from Scotland they should be ashamed of themselves. Oh by the way, I am genuinely interested, where did Gordon Brown get his figure of 50% want the same system, I am keen to read the research. With an all time record of a 97% percentage of the population registering to vote whether it is yes or no, is something that the population should be proud of and the level of engagement in society! Maybe the English system should have done some teaching on the referendum as its not about getting away from those English (for most folk up here), its about a better way of life, feeling part of something you want to be involved in, a freedom to express your opinion without fear; instead of portraying the whole debate badly, blatant lies and bullying tactics thus creating bad feelings all round. well spoken Charlie, you are my darling! seriously though, I have made my mind up quite a long time ago and am active now,,…..on the streets of Edinburgh, mainly in the working class areas and can assure you that the numbers we are getting ,even at this late stage are in the region of 75% YES. this is from people living in council stairs, with ten to 15 living in the stairs(or more).there are lots of retired, or middle class ,doing quite well folk in a lot of places in the Capital, but the amount of bungalows disnae outweigh the amount of disaffected Labour folk that live in the “schemes” in EMBRA!. people are so pissed off by seeing the bedroom tax, by seeing their Granny’s benefits reduced, by seeing a young family next door unable to pay the rent, by seeing the auld guy along the street being means tested for having a motorised buggy to get him to the shoaps! lots of English, and Welsh and also N.Irish may frown, for want of a better word, on the FACT that Scots have had enough of the current situation and some may think that we are in some way “traitors”. I beg to differ, and hope that we can, in the event of Independence become good neighbours. The currency issue is always going to the big thing, during the Referendum vote, and as you English have always thought, when it comes to money , we are as tight as “a ducks arse”.I disagree on that btw, but nevermind,. I do have an issue though, when it comes to our currency. for nigh on 30 years, I have had problems trying to pay for Deisel, sandwiches, parking etc while using the money in my wallet if it happens to be a Clydesdale,RBS, OR Bank of Scotland note of any kind. we actually have a one hundred pound note! I showed it to a young barmaid in Maidstone Kent recently and she was reaching for the phone to get the POLIS! she then wanted to marry me. but, you guys need to get to grips with the fact that we are quite different, in the respect that we will NEVER accept or Vote for Conservative policies, and that kind of thinking is just not Gonnae happen! Jim(Nisbet) , not a truer word has been spoken over the last week! they have another Agenda, not thinking what’s best for our nation. I hope and pray that our fellow Scots see through the mist that has been thrown up by the massive government/media/Westminster panic mongers who have put immense pressure on banks, retailers etc to try and frighten us . Stand firm Scots ,our day will come and we will be a Nation. Erm, there is not a single quote from Gordon Brown in that article. Amazing what can be fabricated from thin air. Nice try Yes campaign. Brown & his Darling chancelor gave Britain Austerity so how can they claim to know what’s best for Scotland.Amen. What worries me is that this man actually said what he did just days before the vote. Is he trying to influence the Yes campaign.. I hope so! What do you expect from the man who sold off a sizeable portion of Britain’s gold reserves for Euros. What a plonker! First, bribery, then desperation, and now outright destruction of Scotland’s higher education system. Brown wants destroy the very education system which nutured him. Talk about cutting of your nose to spite your face. I find myself alarmed at this piece of news,as for being extinguished as a country then it would apply to England also being extinguished as a country and just being southern Britain. We must be independent or for real be obliterated from history.